In an era in which NFL defensive coaches have begrudgingly resigned themselves to the fate of their Big 12 counterparts, allowing once record-setting yards and points on a regular basis, Michigan's Don Brown stands apart. Outside of perhaps only Nick Saban, no coach is as respected in an industry that gets harder and harder each day. Heading into the final week of the 2018 FBS regular season, 10 teams average 500 yards-per-game of total offense, while 71 average 400 or more. This is a drastic departure from just a decade ago when only five teams held a 500-yard average while just 36 that eclipsed the 400-yard mark. In that time, Brown's defenses have consistently been among the nation's best, with every unit but the 2013 Boston College Eagles - his first season with the program - holding opponents under the 400-yard mark on average. This season may be his finest work yet, however, as his Michigan unit has held offenses to a staggeringly low total of only 234 yards-per-game, the lowest such total since Alabama's historic 183-yard average in 2011. To achieve such results, Brown has bucked the approach of many peers, getting more aggressive at a time when many defensive coaches have focused on building a 'bend but don't break' philosophy that looks to create turnovers and get stops once the field shrinks inside the red zone. Although the Wolverine offense is improved, it's not as explosive as many others, meaning the program's current #4 ranking in the CFP rankings is based primarily on the performance of Brown's defense, which is an extension of their coach's personality. "I just like the challenge of stopping people," Brown recently told Ivan Maisel of ESPN.com. "The demeanor and the culture that you try to develop on the defensive side of the ball fits my personality better. In life, you figure out who you are." 1) "We must stop the run"
Though many offenses consistently operate in three and four-receiver sets to stretch the field, Brown insists that all 11 players in his defense be involved in the run game. Despite the fact that his secondary plays a great deal of man-coverage (more on that in a minute), it's not uncommon to see a maize and blue defensive back make a tackle on a run play. The main reason being that Brown engineers ways to create overhang defenders on both sides to set the edge and turn plays back inside, which then allows the front to do its job and get penetration. The result is many speed sweeps that would seemingly negate the efforts of talented ends Chase Winovich and Rashan Gary are cut off and turned back toward a collection of flowing linebackers. One way teams would often combat that aggressive play-side overhang is to create natural cutback lanes through the use of a Split-Zone run in which the tight end or fullback comes back across the formation to kick out the end. This block often catches the defense flowing too fast in the opposite direction and unable to defend the extra gap on the back-side - a problem for which Brown has multiple answers. Brown's primary goal is to keep things simple for the front four, meaning their responsibilities don't change if the tight end comes back across the formation. The first way Brown handles it is by "spinning" the responsibilities of versatile SAM linebacker Khaleke Hudson (#7) and the opposite safety, often Tyree Kinnel (#23), with Kinnel coming down to seal the edge while Hudson drops in coverage. To keep teams from using such movement from the tight end to open up lanes in the passing game, Brown will simply ask Hudson to "travel" with the blocker, beating him to the edge. But this aggressive approach to sealing the edges occasionally allows for an open seam in between the tackles, especially when offenses creatively use motion to manipulate a defender's alignment. However, Brown stresses the fundamentals to such a degree that players rarely get out-leveraged more than once. "I mean, I can't think of any times where he gets hit with the same call twice," Harbaugh told Maisel. "Maybe once since he's been here." 2) "In the passing game, make them earn it"
Brown's approach is exactly how it sounds. 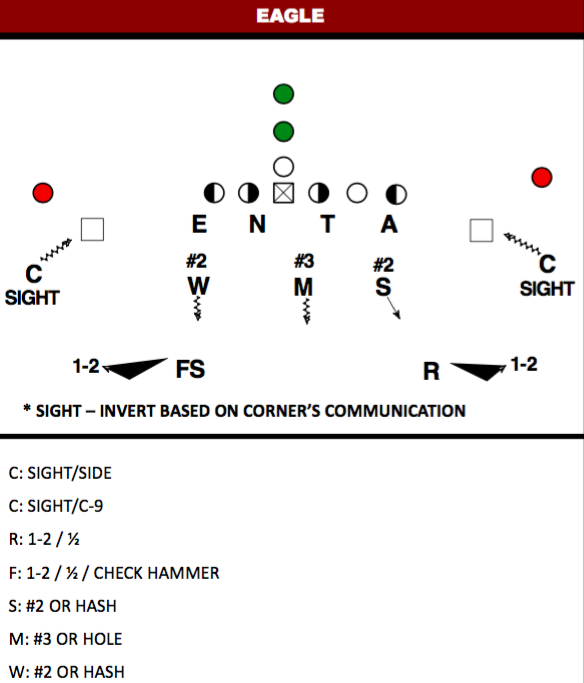 By mixing straight man-to-man and Cover-2 Trap coverages, Brown keeps offenses from completing quick, easy passes and ever getting into a rhythm. As a result, opposing quarterbacks have completed only 47.1% of their passes this fall, resulting in an average of only 4.9 yards-per-attempt which is easily the best such mark in the nation. Additionally, the Wolverines have allowed only 7 touchdown passes while intercepting 11 passes of their own, meaning that despite Dwayne Haskins' record-setting pace this season, the Buckeye passing game will have its work cut out for it. Due to their focus on making plays in the run game, Michigan's safeties often roll down to cover slot receivers with outside leverage, allowing them to peak in the backfield while in man-coverage. However, this approach allows for slants from the slot, especially when combined with a run play as part of an RPO. Led by a pair of cornerbacks in David Long (#22) and Levert Hill (#24), Brown often isolates his outside defenders to the boundary and lets them lock up with opponents, with their only instruction be not to allow the receiver inside. All throws must be dropped into the small window between the defender and the sideline, creating a high degree of difficulty. ...or with Switch routes that can create miscommunication. But Brown is well aware of these tactics and instead of installing entirely new schemes to limit their effectiveness while allowing others to be successful, the veteran defensive coach spends his time working on the fundamentals of press coverage, communication, and handling crossing routes to ensure his players can react quickly instead of pausing to think about their responsibility. 3) "We are a package team"
While many college defenses are based on a specific system that trains players to fit the same roles year after year, Brown doesn't hesitate to use a variety of personnel groupings and alignments to suit the talents of the players at hand. Versatile players like Gary, who can create penetration both off the edge or over the center, and Hudson, who can play any of the safety or linebacker position, and even middle linebacker Devin Bush, who is fast enough to run with many receivers, are the key to unlocking these alternative looks. These hybrid players not only allow Brown to line up his unit in multiple alignments with the same personnel, but they create more opportunities for other players to share the workload. For instance, outside linebacker Josh Uche plays a great deal as a pass-rush specialist despite rarely appearing in the base defensive package thanks to his ability to create pressure on the edge. While sometimes difficult to implement, this approach has multiple benefits. Not only do opposing offenses have to prepare for far more looks in their game plans, but it gives the defense a number of ways to get extra speed on the field and create mismatches in their favor. 4) "Get off the field on 3rd down"
Brown stresses the importance of this situation more than any other. He feels it's critical to get off the field as fast as possible, showcasing a variety of alignments and never-ending blitz packages that keep offenses off-balance. By playing solid run defense on early downs, opponents are almost always forced into passing scenarios on this critical down, allowing Brown to bring pressure from all over the field. Even when offenses can spring a receiver open, as seen below with the running back in this Snag concept, the QB doesn't have time to go through his progressions and find the open man thanks to the extra pass rushers. Thanks to the versatility of the players on the field, as mentioned above, Brown will often show one look before dropping defenders near the line into coverage and overloading the pressure from one side. Even when offenses are able to complete a big pass, the degree of difficulty is once again at an extremely high level, as receivers rarely spring open in these scenarios. Opposing offenses have only converted 31% of third downs this season, the 11th-best such mark in the nation. However, when offenses have to gain seven yards or more on third down, they've only converted 17% of the time. For Ohio State to pull off the upset in both teams' biggest game of the season, they must find ways to stay ahead of schedule and avoid long third downs. This was much easier said than done when J.T. Barrett was around to pick up difficult yards in the run game, making a 2nd-&-7 a 2nd-&-5. Whether it's on the ground with Haskins, J.K. Dobbins, and Mike Weber or through the air with their veteran receiving corps, the Buckeye offense will have their work cut out for them. But while Brown has held OSU to 350 yards or less in both contests since arriving in Ann Arbor, he's never come away with a victory. Will 2018 finally be his year?